Delaware allows students to earn dual credit in academic and/or CTE courses through dual credit taken at their high school, postsecondary institution, or online. Public postsecondary institutions are not required to accept these credits; however, they have agreed to do so for courses in which the student earned a “C” or higher (Education Commission of the States, 2015). 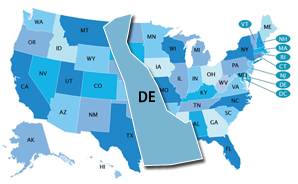 Delaware is not participating in the Early College High School Initiative (ECHSI). For more information about schools participating in ECHSI, visit the ECHSI website (Jobs for the Future, n.d.). Within these areas, Delaware is developing, but not yet implementing, programs of study aligned with each of the 16 Career Clusters. In 2007, Delaware mandated that all students in Grades 8–12 have a Student Success Plan (SSP) (U.S. Department of Labor, 2013). The SSP should include academic courses, electives, and extracurricular opportunities needed in preparation for immediate entry into the workforce and postsecondary education. The plan encompasses at least five years, including one year beyond high school. The student, advisor, and student’s parent and/or guardian work together to develop the SSP; ongoing monitoring and an annual review process are required (State of Delaware, n.d.). Students intending to major in certain fields are encouraged to take additional years of mathematics, science, and other subjects, depending upon the major. Delaware’s state-specific Early Warning System is called the Dropout Early Warning System (DEWS). Early Warning System data are reported at the student level to teachers.